If I lean my head out of my kitchen window and turn to face east, I can glimpse the paper mill across the water, perpetually billowing steam or smoke or something almost every day. The Simpson Tacoma Kraft Paper Mill (or is it West Rock or something else?) is blamed for the infamous Tacoma Aroma. In the 1990s the paper mill was retrofitted in such a way to reduce sulphur emissions by a great deal, so now the aroma is a rare occurrence. My reference photo comes from my trip around Commencement Bay last summer. The day started sunny; clouds rolled in creating a bright but overcast sky in one direction, brilliant blue in the other. I am trying to be more expressive with color and less fidgety overall. One of the best critiques I got in art school was that I have a tendency to draw with paint instead of paint - painting is not defined so much by the medium of paint, but rather the almost sculptural approach to building form and space with broad application of color (paint strokes). This is why you can call a digital piece or a charcoal drawing a “painting”. I recall a bit of advice: paint with the largest brush you can. This forces you to think in terms of form and color and less in terms of creating an outline of a shape and filling it in. I think I am improving in that regard. I chose to use a cadmium red underpainting (cad red is really quite orange) and it helps the blue of the sky come forward. I chose to try and be fast and loose with the forms of the paper mill itself. There are lots of fiddly, tiny details to get lost in. I like those details - but I want to capture the feel of the place. So I chose to focus on the “big ideas” of the place. 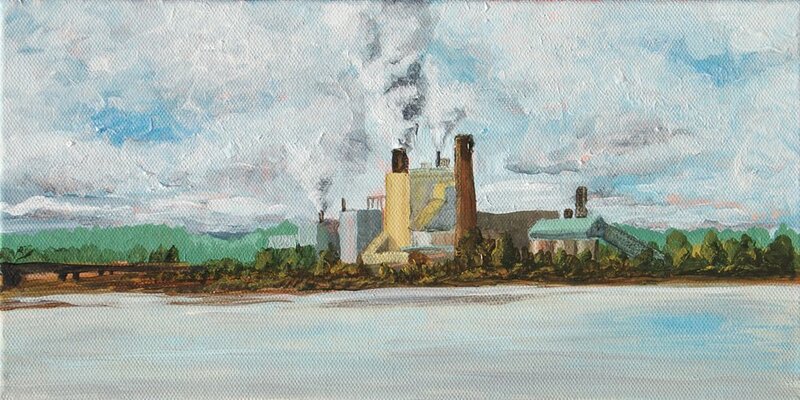 The large central building, the smokestacks, their fumes.